SDL supports modal menus and keyboards. These are requests for input from the user based on a list of options you present to the user – that they can respond to via touch or voice (if supported) – or via their own keyboard input. There are several advantages and disadvantages to this kind of menu compared to the main menu. The main menu should remain more static and should not be updated often and only in predictable ways. The main menu is the best way to perform navigation for your app. By contrast, a popup menu is better for a selection of options for your app, and allows for a keyboard to be available for search or other user input. You may think of presenting a popup menu as presenting a modal UITableViewController to request input from the user. You may chain together menus to drill down, however, it is recommended to do so judiciously, as requesting too much input from the driver while he is driving will be distracting and may result in your app being rejected by OEMs. An SDLChoiceCell is similar to a UITableViewCell without the ability to arrange your own UI. We provide several properties on the SDLChoiceCell to set your data, but the layout itself is determined by the company making the head unit system. On many systems, including VR commands will be exponentially slower than not including them. However, including them is necessary for a user to be able to respond to your prompt with their voice. If you know what some or all cells should contain before they are used, you can "preload" these cells in order to speed up their presentation at a later time. The cells you preload may be used individually or a group. Whether or not you preloaded cells, you may present a menu. If you did not preload cells, calling a present API will cause them to be preloaded and then presented once they are available. Therefore, this call may take longer than if the cells were preloaded earlier in the app's lifecycle. On later presentations using the same cells, it will reuse those cells (unless you deleted them of course), so later presentations will be faster. When you preload a cell, you do not need to maintain a reference to it. If you reuse a cell with the same properties that has already been preloaded (or previously presented), the cell will automatically be reused. In order to present a menu, you must bundle together a bunch of SDLChoiceCells into an SDLChoiceSet. If the SDLChoiceSet contains an invalid set of SDLChoiceCells, the initializer will return nil. This can happen, for example, if you have duplicate title text or if some, but not all choices have voice commands. Layout: You may present your menu as a set of tiles (like a UICollectionView) or a list (like a UITableView). If you are using tiles, it's recommended to use artworks on each item. In order to present a menu, you must implement SDLChoiceSetDelegate in order to receive the user's input. 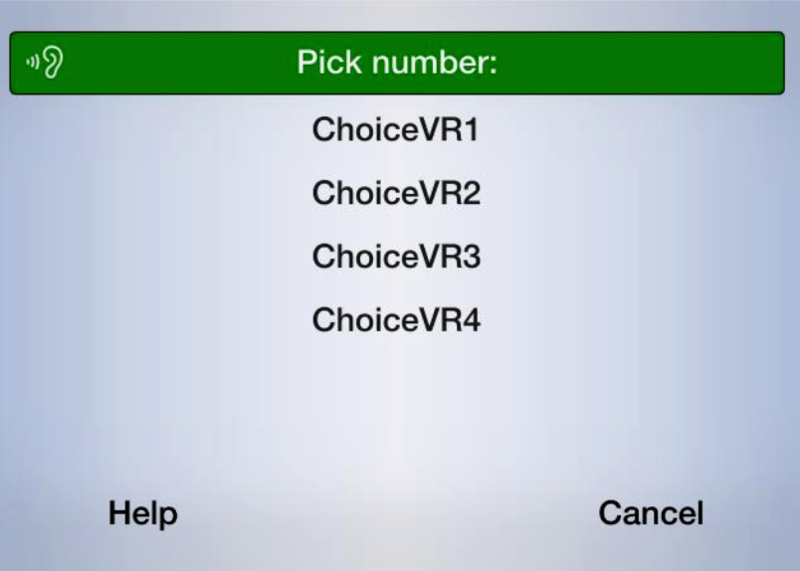 When a choice is selected, you will be passed the cell that was selected, the manner in which it was selected (voice or text), and the index of the cell in the SDLChoiceSet that was passed. Finally, you will present the menu. When you do so, you must choose a mode to present it in. If you have no vrCommands on the SDLChoiceCell you should choose SDLInteractionModeManualOnly. If vrCommands are available, you may choose SDLInteractionModeVoiceRecognitionOnly or SDLInteractionModeBoth. You may want to choose this based on the trigger source leading to the menu being presented. For example, if the menu was presented via the user touching the screen, you may want to use a mode of .manualOnly or .both, but if the menu was presented via the user speaking a voice command, you may want to use a mode of .voiceRecognitionOnly or .both. It may seem that the answer is to always use .both. However, remember that you must provide vrCommands on all SDLChoiceCells to use .both, which is exponentially slower than not providing vrCommands (this is especially relevant for large menus, but less important for smaller ones). Also, some head units may not provide a good user experience for .both. In addition to presenting a standard menu, you can also present a "searchable" menu, that is, a menu with a keyboard input box at the top. For more information on implementing the keyboard portion of this menu, see Presenting a Keyboard below. You can discover cells that have been preloaded on screenManager.preloadedCells. You may then pass an array of cells to delete from the remote system. Many times this is not necessary, but if you have deleted artwork used by cells, for example, you should delete the cells as well. Presenting a keyboard or a searchable menu requires you to additionally implement the SDLKeyboardDelegate. Note that the initialText in the keyboard case often acts as "placeholder text" not as true initial text. Keyboards are unavailable for use in many countries when the driver is distracted. This is often when the vehicle is moving above a certain speed, such as 5 miles per hour. Using the SDLKeyboardDelegate involves two required methods (for handling the user's input and the keyboard's unexpected abort), as well as several optional methods for additional functionality. If you don't want to use the SDLScreenManager, you can do this manually using the SDLChoice, SDLCreateInteractionChoiceSet, and SDLPerformInteraction RPC requests. You will need to create SDLChoices, bundle them into SDLCreateInteractionChoiceSets, and then present those choice sets via SDLPerformInteraction. As this is no longer a recommended course of action, we will leave it to you to figure out how to manually do it.